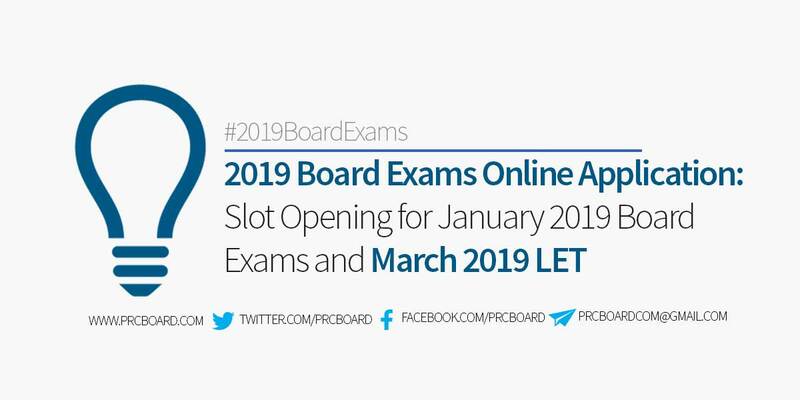 Manila, Philippines - The Professional Regulation Commission (PRC) announced the opening of slots for 2019 board licensure examinations. Applicants who wishes to take the exams on January 2019 for the following professions may now file secure their appointments through the Licensure Examination and Registration Information System (LERIS). The list below is courtesy of PRC. PRCboard.com is one of the trusted websites that provides timely and reliable information in any board examinations conducted by the Professional Regulation Commission and other related-government agencies. For verification, we recommend to refer to PRC official website. To keep updated on the 2019 PRC applications for board exams of other professions such as Nursing, CPA, ECE, Electrical Engineering, Civil Engineering, MedTech, Criminology, among other professions, we advise our visitors to bookmark this page, visit PRC official website, follow us at our social media pages via Facebook and Twitter or join the members discussions at our Facebook Group. When is the deadline for LET exam filing? When will be the opening filing next for let march 2019? Kailan po ang filing sa LET exam for march 2019? Kailan po ba mag open ang filing for March 2019? When the opening for RME board exam april 2019? Kailan po open ang filing sa let exam for march 2019? kailan po ang deadline ng filing pra sa let ngaun march 2019..salmat po.. When will be the opening of Filing for LET Board Exam march 2019? When will be the opening of filing for MIDWIFE board exam 2019 ? When will be the opening of teachers board exam? hello po. Retaker po ako sa march, panu po kung nawala yung NOA ko? panu ko po malalaman application # ko..
KILAN PO START NG FILLING FOR LET OF MARCH PO? goodafternoon po kailan po ang last filing for the march 2019 examination? paano po makakapag online registration kung laging nakalagay page not available? kelan po mkpag access sa link? Kailan po ang filling sa CLE sa June 2019? for NLE? wala pa pong opening slot for appointment?? ?